The fourteen classics on display included three Italian masterpieces of design – a 1948 Alfa Romeo 6C2500 Sport ‘Freccia d'Oro' (chassis number 916 050) the 1969 Pininfarina Sigma Grand Prix and the 1981 Pininfarina Quartz. Starting with the Bordeaux red Alfa Romeo 6C2500 Freccia d'Oro, this car is one of the most glamorous cars penned by Carrozzeria Alfa Romeo, then established at Portello. 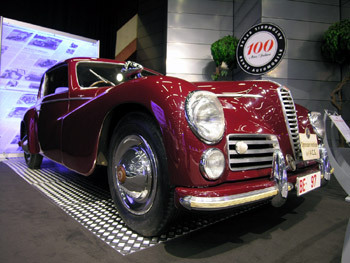 It was also the first post-war car created by Alfa Romeo (in 1947), and its nickname translates as Golden Arrow. In fact, on this model the Alfa Romeo scudetto grille incorporates an arrow, however the vertically-placed strip is finished in silver rather than gold. The Freccia d'Oro's chassis and engine stem from before the war, when in 1939 Alfa Romeo introduced the 2.5-litre six cylinder unit and the Sport and Super Sport chassis. The six-cylinder engine was basically an enlarged version of their previous 6C2300 block. Fitted with a single down-draught carburettor in the Freccia d'Oro, the 2,443 cc DOHC unit produced 90 bhp at 4,600 rpm. Despite its age, the car's chassis was still highly advanced for its time, featuring all-round independent coil suspension and specially cooled hydraulic brakes. This excellent road-holding (for the period) was met with a top-speed of 147 km/h and a 0-100 km/h time of 22.3 seconds. The Freccia d'Oro's good performance was complimented with handsome 2-door coach bodywork inspired by the advanced pre-war designs of Carrozzeria Touring. Featuring a wonderfully arched roofline, the Freccia d'Oro offered seating for five, with a three-seat bench up front and a two-seat bench behind. The glamorous dashboard and interestingly shaped controls further added to the car's charisma and romance. As was typical of the day for Italian automobiles, all examples were built with right-hand drive. This was for use on the Alpine passes, so when driving on the right the driver was also on the right and could see the edge of the road. Falling off the edge of the road was considered a greater danger than head-on collisions, and in fact modern Italian trucks in the Alps are still often right-hand-drive for the same reason. The Freccia d'Oro's four-speed gearbox was operated by a column mounted shifter. Only 680 examples were ever built until production ceased in 1952, all going to wealthy customers including King Farouk of Egypt, Alì Khan, Rita Hayworth, Tyrone Power, and Prince Ranier of Monaco. The Freccia d'Oro model also infamously starred in the film ‘Godfather' (1972), where it was unfortunately blown up (how times change). Nowadays, the Freccia d'Oro is a real collector's item for the dedicated Alfa Romeo enthusiast. The special example on display in Geneva belongs to the Berne-based Braunschweig family. Robert ‘Brauni' Braunschweig happened to be the editor of Automobile Revue, and bought the car in 1948 before starting a lengthy ‘road test' period for the magazine in the same year. At the time, the policemen in Berne gave the Freccia d'Oro the nickname of ‘aircraft carrier' due to the combination of its stately size and loud aftermarket Abarth exhaust. Although the car was owned by the editor, it was always fitted with the number 97 red ‘road test' sign. The police were initially a little perturbed, however were later reassured when Braunschweig explained that the sign denoted a ‘long-distance test car'. Indeed, the car remained on test for 20 years, with the final report being published in Automobile Revue in 1968! ‘Brauni' drove the six-cylinder Alfa Romeo regularly until 1980 when he retired, after which time it has remained in the Braunschweig family estate. Unfortunately, Robert Braunschweig died in 2001, however hundreds of anecdotes still surround his most favourite car. One such anecdote materialised during a ground-up restoration in the 1960s by Graber in Wichtrach, when Braunschweig ordered them to make the No. 97 test sign light up in the same shade of wine-red as the car, instead of the official red. Highly illegal of course (especially in Switzerland), but the police at the time turned a blind eye. Other than the No. 97 sign, special features on this particular Freccia d'Oro include the vertical arrow on the grille, wing-mounted mirrors, a unique rear taillight design and roof-rack mounting points. 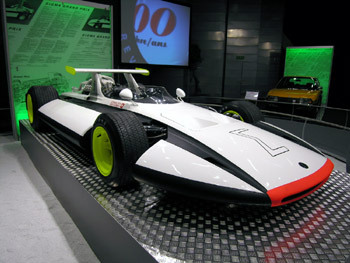 Positioned centrally at the very end of the hall (directly next to the Alfa Romeo), the Pininfarina Sigma GP concept from 1969 forms the most interesting and important car on show at the display. This particular concept car has a direct link to Automobile Revue, and indeed the magazine's logo can be found on the car's flanks. The concept was originally unveiled at the 1969 Geneva Motor Show, and anticipated many of today's safety features implemented on racing cars. Above: the Sigma GP was on display, borrowed from the Pininfarina factory collection. Below: the 1948 Alfa Romeo 6C2500 Sport Freccia d'Oro was owned by Robert Braunschweig from new, and had an 'elongated test period' of 20 years. The car is still in the Braunschweig family. Above: the Sigma Grand Prix was developed by Pininfarina along a brief prepared by Automobile Revue editor Robert Braunschweig to increase safety in motor racing. Below: in 1981 Pininfarina built the Audi Quartz to celebrate 75 years of Automobile Revue. Due to the dangerous nature of motor sport at the time, Automobile Revue developed the idea to create a concept car with an energy absorbing body. A committee was set up in 1968 under the direction of chief editor Robert Braunschweig, Sergio Pininfarina and Ernst Fiala of the Berlin Technical University. Further members included Michael Henderson (an Australian physician) as well as Paul Frère (combined engineer, journalist and successful racing driver). The project was supported by Enzo Ferrari, who donated the mechanicals of a 312 Formula 1 car. Additionally, advisors from Fiat and Mercedes-Benz helped develop the ideas. The Sigma Grand Prix name was selected because Pininfarina had already developed a Sigma safety research sedan some years beforehand (1963). 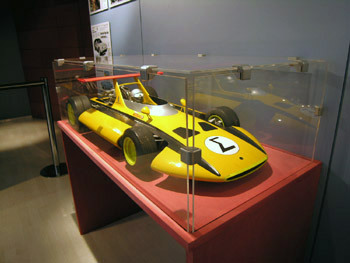 After the go-ahead was given in summer 1968, Pininfarina crafted two 1:5 wind tunnel models from wood, as well as the 1:1 prototype, within record time in their Turin studios. The styling was the work of Paolo Martin, who was also responsible for the famous Modulo concept car which appeared at the Geneva Salon the following year. The characteristics of the butterfly-formed Sigma racing car concentrated on a backbone chassis creating two compartments for the cockpit and engine which have collapsible structures in front and behind them, reinforced sides, integrated wheels to minimise risk, a spoiler forming a protective roll bar, special rubber safety fuel tanks, an automatic fire-extinguishing system as well as an extremely well thought-out seat harness system with tensioners and helmet belts. Further features included a telescopic steering column, automatic intertia switch for the electrical system and reinforced fuel lines along with automatic cut-off valves. Today, the 1:1 Sigma Grand Prix prototype is in the possession of Pininfarina. One of the wooden windtunnel models went to Ferrari, and the other was given to the Automobile Revue office. This particular model was also presented at the main Automobile Revue stand in Hall 4. Automobile Revue have a particularly intimate relationship with the Audi Quartz, as it was dedicated to the magazine by Pininfarina for the publication's 75 anniversary in 1981. In summer 1980, Sergio Pininfarina surprised the magazine with the announcement that he wished to create a concept car dedicated to Automobile Revue at the Geneva Salon of 1981, based on the (then) brand-new Audi Quattro Coupe. The advanced all-wheel drive Quattro technology offered on the original 2+2 coupe from Ingolstadt was hidden beneath a rather unexciting body, and hence the decision to use this car as a base was made. 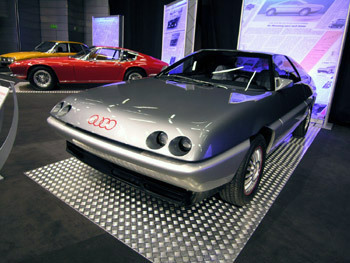 Audi was willing to cooperate, and donated a 1980 Quattro Coupe. Under the direction of Leonardo Fioravanti, at the time director for research and development of Pininfarina S.p.A., Enrico Fumia penned a graceful coupe shape 30 cm shorter and 8 cm lower than the original. Due to this, the Quartz clearly offered less space in the rear than the standard 2+2 Quattro, but it looked futuristic and stylish compared to the sober original. The Quartz represented a timeless ground-breaking design for Pininfarina. Not only was the cars shape largely used on the Alfa Romeo 164 sedan, but moreover the entire shape formed the basis for the 1995 Pininfarina Alfa Romeo GTV and Spider. Notable design achievements included the clamshell bonnet masking the headlight units into quasi-quad round spotlights, an aerodynamic front spoiler, aerodynamic colour-coded bumpers and side mouldings to reduce the amount of spray when driving in the wet. Above all, the Quartz concept was fabricated from exotic materials, and featured interesting styling features such as the exhaust which was shaped in the form of the four Audi rings: amazingly this element was not taken over by Audi designers. The prototype was fully driveable and Automobile Revue was able to use it in an extensive test run with road performance measurements some years later. The turbocharged 5-cylinder 200 bhp Audi Quattro underpinnings, when combined with the slippery Pininfarina shape, gave good performance results. Top speed was 217 km/h, 0-100 km/h came up in only 7.1 seconds and 0-180 km/h took only 18.7 seconds. These are figures which put most modern-day 2-litre production cars to shame. Other cars on show in the centenary display include the 1948 Porsche 356 Prototyp, 1948 Delahaye 135 MS Cabriolet Graber, 1905 Dufaux, 1936 Auto Union Typ C, 1967 Toyota Corona, Monteverdi Highspeed 375 S, 1966 Ford GT40, 1931 Bugatti Type 51, 1959 BMW 507, 1956 Mercedes-Benz 300 SLR and a NSU Ro80. The display was realised by Expomobilia.